The Papercut Kiosk is located in the South West corner on the Main floor of the Ablah Library. Papercut is the WSU Libraries printing system. We no longer use Shocker Cards for print jobs. 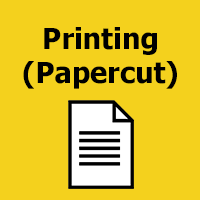 Instead the cost of printing is deducted directly from your Papercut account. Papercut allows you to add money to your account directly using a credit or debit card, and makes it possible for you to print to Library printers without using a library computer by using the web print option. Go to Papercut and login using your Shocker ID and Password. You can add money directly to your Papercut account with a credit or debit card by using the "Add Credit" option. 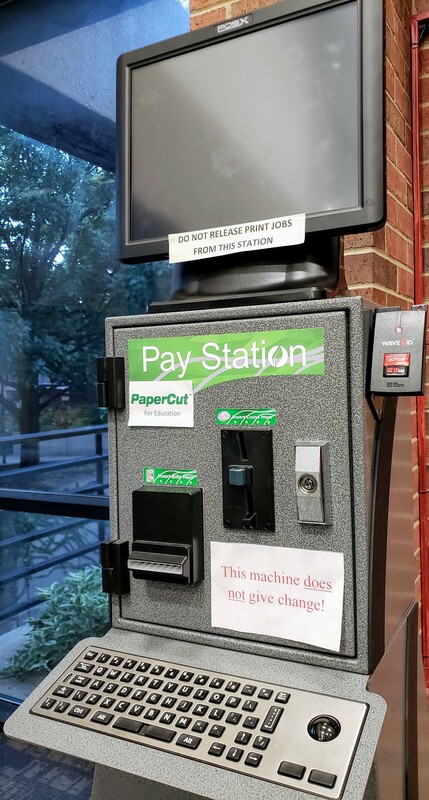 Use the Papercut Kiosk in the lobby of the Ablah Library. Cash ONLY and NO refunds can be given from this machine. Color printing is available but only at Printer #5 and costs $0.25/page. What about the money still on your Shocker Card? You can still use it to make copies, or you can go to the Shocker Card office in the RSC to ask for a refund. To print using you Laptop log onto Papercut and choose the "Web Print" option on the left-side navigation bar. All Web Print jobs must be in PDF format.